It’s the 100th edition of the Weekly Before & After! To celebrate, we compiled a list of the top 10 transformations so far. But before we begin, let’s look at two that just missed the cut. This Sterling Silver Ring was badly misshapen and needed a lot of work: reshaping, resizing, multiple breaks had to be soldered, and more. But our Master Jewelers were able to bring some magic back to this ring. Weekly Before & After #48. This Accutron Watch from 1970 that required a full restoration on both the interior and exterior. Detailed clean and overhaul of the movement, dial refinishing, stem and crown replacement, crystal replacement, and a new band. But our watchmakers loved working on it. And the results show it! This gold wedding set unfortunately became stuck on the clients finger and had to be cut off. To bring this wedding set back our master jewelers had to perform a half shank repair, size them, and solder them back together. It is then all wrapped up with our signature clean and polish and it’s good to go. The very first post caught a lot of eyeballs. It’s not hard to see why, as this ring looked unrepairable after having literally gone down the garbage disposal. Needless to say, the customer was shocked at how good it looked after MJR delivered on its promise. Now if this ring had been made of a solid metal like gold or silver, this repair would be a bit more of our standard everyday repairs. But this ring, had a hollow shank. Which meant that a slight misstep on the reshaping of the shank could totally destroy the ring! This is a task made for our Master Jewelers! All of the repairs on this list were pretty challenging. But one of the first to truly raise our game was this Black Starr & Frost timepiece from the 1920’s. Our sourcing team spent weeks tracking down all of the antique original parts for this watch. But they got all of the original parts to get this beauty to start ticking again. Similar to a repair that we had before we started our blog, this kind of repair brings out the best in our Jewelers. It’s the kind of repair that makes you think your friend is exaggerating when she tells you about it …but then the jaw dropping pictures make you a believer. This white gold ring was unrecognizable because it was in pieces and missing 3 diamonds. We can list all of the work we had to do, but we think the pictures show far more than anything we can say. This vintage Bulova Accutron stems back to the 1940’s. So much like our Black Starr & Frost example above, this was a challenge in sourcing original parts. Once that was done, all we had to do was hand it over to our Experienced and Certified Watchmakers to make sure the work was done with precision and voila! 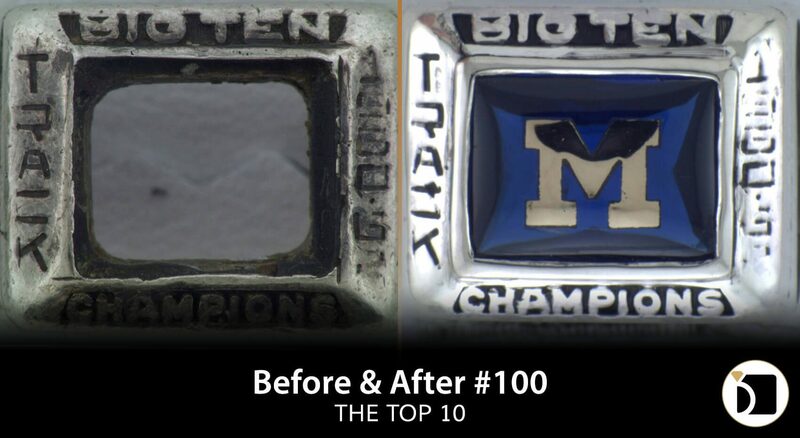 This championship ring required the advanced skills of our Master Jewelers. It needed rebuilding the bezel, custom cutting a stone, engraving the stone, using our 3D printer to create the gold inlay piece, and more. This restoration was such an amazing transformation, it had to take the number one spot.